Disclaimer: you shouldn’t actually cook one-handed, especially if you’ve got a baby in the other arm. But I admit, as a mother of two with a partner who works nights, that I’ve tried it. If you’ve ever been alone, trapped under a sleeping baby or limited due to holding an ‘unputdownable’ baby (I’m sure that’s a word, this is a small child who won’t sleep but you can’t put down anywhere else, such as a play mat, a high chair, a pram, a bed, a car seat, a crib, or your partner’s or other child’s arms, without screams and crying), you’ll relate to this post, I’m sure — and even if you haven’t experienced this, perhaps this will serve useful one day for a similar situation. I found myself one evening, out of desperation, typing the words “meals you can prepare with one hand” into the search bar and coming up with nothing. There are plenty of helpful suggestions on meals you can eat with one hand (honestly, you can eat nearly everything one-handed, believe me, I’ve attempted), but not so much on what you can cook with one hand. I was of course hoping there was some mind-blowing secret to preparing something simple, tasty, comforting and nutritious to be able to cook and feed myself and my older daughter while holding a cranky, clingy, teething four month old baby on one hip. On a particularly difficult low point, I ended up making a peanut butter sandwich for her (spreading peanut butter with one hand is not as easy as it looks) and the leftover crusts became my dinner. But then I realised why that secret doesn’t exist — because you’re not actually meant to cook with a small baby in one arm! Well, especially not one who can’t sit up on her own yet and has a tendency to lunge at anything shiny. Having had two babies who are unputdownable in their own different ways and a husband who works nights, I have learned to adapt. I have learned to be prepared. And this is the real secret to cooking one-handed with a baby. Prep. 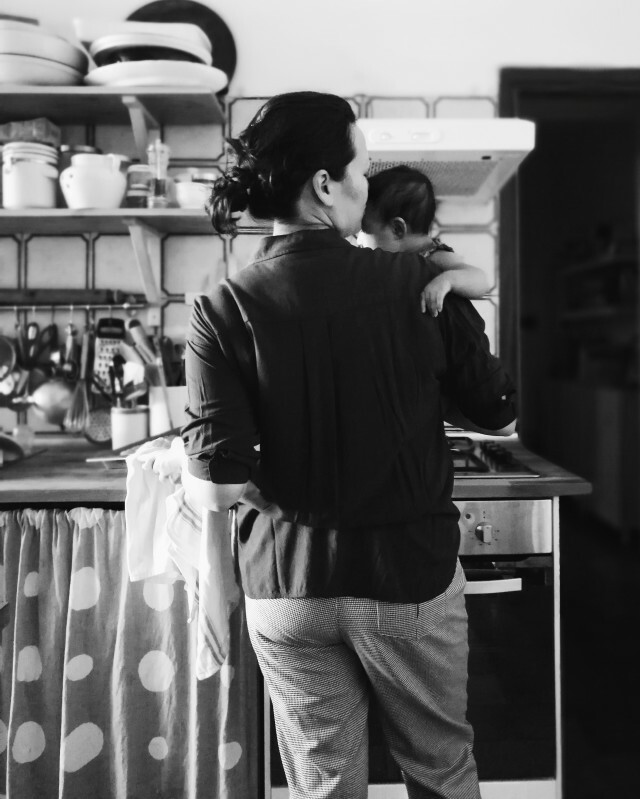 You want to prepare as much as you can while you have two hands, possibly another adult around and either a calm or napping baby (for me, this is always the morning). I peel and cut vegetable sticks (pop them in an airtight container or glass filled with water in the fridge, this keeps them crunchy) or slices of fruit (dip apple pieces in slightly salted water to stop them from browning) for after-school snacks. Even slicing bread or grating cheese, or anything else that involves a sharp knife, is good to prepare ahead. Anything noisy like blending a soup, hummus or smoothie I try to do during this time too. Make your meal ahead of time. If you can, think ahead. In the summer, I’d make big, hearty salads full of beans (often a variation of this one or this farro salad), canned fish or boiled eggs in the morning and keep them in the fridge ready to pull out for dinner. Or I’d make a big batch of peperonata, which gets tastier as the days go by, and reinvent it in various ways (on toast with mozzarella, as a pasta sauce, on top of grilled chicken or fish). Ditto for the meatballs here below — delicious in or out of the tomato sauce, in a sandwich, in pasta, on their own. In the cool weather, it’s minestrone, pumpkin soup, curry – things that are easy to reheat on the stove, do well being reheated and in batches so I can portion into servings that go in both the fridge and the freezer (for those days when I’m not so prepared). I can’t tell you what a lifesaver it has been just having jars of homemade pomarola or batches of frozen beef ragu around. Eat leftover lunch for dinner. A variation on the above, sometimes, I’d just make my big salad a little bigger than normal and finish the rest at dinner. Keep it simple. On hard days, when I haven’t had time to prepare anything, I resort to the easiest thing. My picky older daughter’s two favourite go-to meals are ones I can luckily manage in seconds: spaghetti olio e parmigiano (simply tossed with olive oil and parmesan cheese) and steamed rice with nori and avocado, cucumber and soy sauce. I can add pesto (a jar of this is often in the fridge) to the spaghetti or miso soup (when I’m in a pinch, I use the best packet kind, brought in our luggage from our last trip to Tokyo) to the rice for myself — the best flavour and nutritional boosters with minimal effort! Some other fantastically simple but delicious and nutritious dinner ideas: eggs in any which way; creamy chickpea soup (this is a recipe from my first cookbook Florentine, it’s literally, garlic, canned chick peas, water, some rosemary is nice if you have it, and blend) and mozzarella alla pizzaiola (or cheesy tomato toast as we decided to call it in this version for The Guardian). Keep things handy. Make your kitchen work for you. Put the things you need/use often on shelves where you don’t have to bend down to get or stand on a stool to reach. Keep tea bags or whatever your favourite stand-by, calming beverage is, in a container with a lid you can pull off with one hand. Keep a pretty bowl of fresh, seasonal fruit on the table (the easiest way to get a healthy snack, one-handed). I’ve also made my older daughter’s favourite healthy snacks easy for her to reach — so if I’m trapped under a baby during a feed, she knows where to go to fix herself a snack until I can free myself (as a bonus, she and I are both enjoying her new found independence)! It’s not rocket science but these things have helped me enormously and made it possible to prepare dinner alone, one-handed with a baby on one hip and a hungry nearly-six-year-old waiting in the wings. 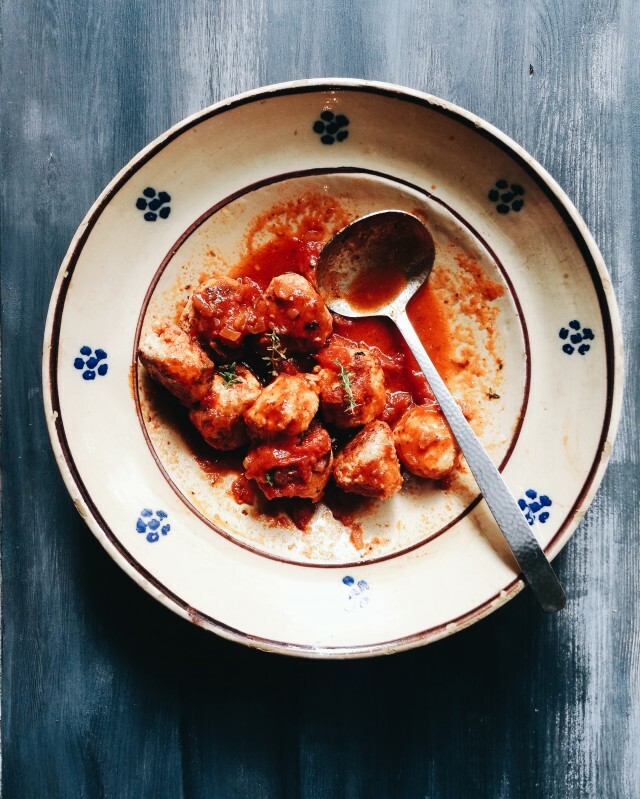 I leave you with this recipe for chicken and ricotta meatballs. They’re basically a delicate version of Nonna Anna’s beef and pork meatballs, thanks to the ricotta, and are lovely either on their own without the tomato sauce. My heart almost burst when my picky daughter, who likes these plain with mayonnaise, told me these were delicious. I’ve often eaten these at my favourite Teatro del Sale and Trattoria Cibreo but theirs are in a thick, rich tomato sauce, heavy on the garlic. 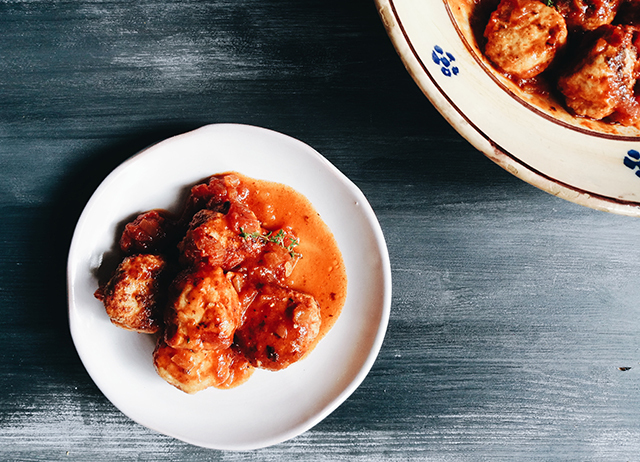 I deliberately made these quite simple so that even picky eaters can appreciate them – leave the parsley out of the meatballs if you, too, have family members who protest anything green — and the tomato sauce is as simple as it gets. But if no one protests, go ahead and add some garlic, fresh herbs or even chilli to the sauce. I like to use chicken thigh for these — more moist and flavourful than breast, but go ahead with breast if you prefer or that’s what you have. Turkey works too. And these are delicious reheated, if not better. Place the deboned chicken thigh in a food processor and blitz until minced well. Place in a bowl along with the ricotta, egg, parmesan, white bread (or breadcrumbs), salt and parsley (if using). Mix well – hands are best. If you like, you can test for seasoning by pinching a small, hazelnut sized piece of the mince and frying it. Add salt or pepper as desired. Shape mince into balls a little larger than golf balls. If the mixture is quite soft (this may be particularly so if your ricotta is not firm but yogurt-like), you can use two tablespoons to help you. Set aside the balls on a tray or plate until you have finished shaping them all. Heat olive oil over medium heat in a casserole pot or deep skillet. Sear the meatballs in batches until browned evenly, then remove to a plate until all the meatballs are cooked. You can serve them just like this otherwise carry on with the sauce below. Turn heat down to low, add a little bit more olive oil if necessary and, in the same pan where the meatballs were cooked (no need to clean it out), gently fry the onion with a pinch of salt until tender and translucent. Add the tomato puree, fill the empty tin most of the way with water and add to the pan. Season with salt and pepper and bring the sauce to a simmer. Return the polpette back to the pot, turn the heat up to medium and bring the sauce to a simmer and cook, uncovered, until the sauce is reduced to your liking, stirring occasionally. Serve immediately, with slices of crusty bread (otherwise keep in the fridge or freezer in an air tight container. Reheat in a pan with a splash of water until bubbling hot). Fascia! Compra una fascia e magicamente avrai di nuovo due mani. Poi a tua figlia deve piacere stare in fascia, ovvio… alla mia piaceva. These look delicious, Emiko. Will definitely be trying them. I never had to cook one-handed with my own children, but I have had to manage in the kitchen with my 12-month-old granddaughter on my hip, and it’s not easy! My hat goes off to you! Looking forward to your next cookbook. I don’t know how you do it! It’s not easy with a one year old either is it? I remember recipe testing my first book with my older daughter when she was about 18 months old — I had to get her involved in the kitchen to make it easier for me! Now she’s almost six and still my favourite egg-cracker and whisking assistant! This scenario sounds very familiar to me and I’m sure it’s the same for lots of other mums out there. Yes, I think I may have tried cooking one handed too out of desperation. Thanks for the reminder that this is neither a practical nor safe thing to do, I’ll need it come mid-May when baby number two is born. 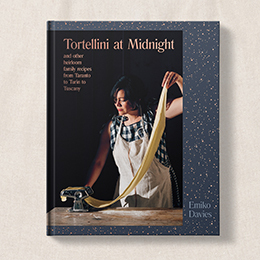 I’m already planning the lasagnas, the agnolotti and the ragus I’ll be freezing for the fourth trimester, when cooking won’t be such an easy task to attend to. In the meantime, don’t push yourself too hard and take care of yourself as much as you can. Really looking forward to more of Nonna Anna’s recipes (this weekend, I may just make some tomato sauce for polpette with pancetta in it like her) and your upcoming cookbook. Oh wow, congratulations! Yes — be prepared early! I was so grateful to have my mum around for the first couple of weeks. She stocked my freezer before she flew back to Australia and I was so sad the day I pulled out the last bag of Japanese fried rice she had made me! Because Luna was born in the beginning of summer (similar due date to yours! 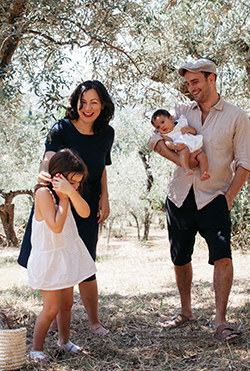 ), I managed to live off caprese salad and prosciutto e melone for a while after that but I soon realised it just wasn’t enough for a breastfeeding mamma, I was so tired all the time (and this one sleeps through the night!) and I had to get organised with more variety and more protein rich meals. I basically wish I had a larger freezer! I made these for dinner tonight. Buonissimi! So light and delicate. They’ll be good for the hotter weather coming up here in Australia. The ultimate accolade was my husband going back for another, and another, and another… I made them pretty much as written, only substituting dry white wine for most of the water. Thanks again for your delicious and doable recipes. Ciao! I made these last night, almost exactly as written, but did a few things differently. Like Christine, I used white wine to rinse the bottle of passata. I had no parsley, so tossed in a small amount of chopped rosemary that needed to be used up, and dusted the polpette with fast-cooking polenta before browning them. Everything was delicious, thank you for this recipe. Sounds wonderful and it’s perfect that you’re able to make the adjustments to the recipe with what you have at home!